What makes you identify as a cancer survivor? Our lives are filled with adventures, opportunities and challenges. We are not defined by any single thing, we are a complicated mix of all of our adventures, challenges and experiences. We are too complicated and our lives are too rich for any of us to be defined by or to ignore a single aspect of ourselves. We had dinner with friends recently. Four of the six of us have been diagnosed and treated for cancer. Two with prostate cancer, one with breast cancer and me with a blood cancer. Three had been treated once. One of the prostate surgery people had had surgery, the other had been treated with radioactive seeds and is still in an active monitoring mode. The person who had been treated for breast cancer had been treated with radiation and then with 2 years of follow up medication. I have been treated four times over ten years. All four times had been with chemotherapy and the last two treatments had included a stem cell transplant and a donor lymphocyte infusion or “T-cell transplant”. One of the prostate people mentioned that he’d seen or heard something that talked about “cancer survivor-ship.” He went on to say that he does not relate to that “identity” at all. The other prostate person and the breast cancer person both agreed. 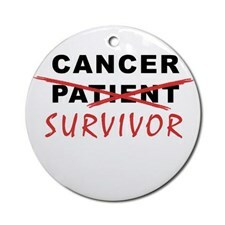 They do not identify as cancer survivors, I do. So what makes someone think of them self as a cancer survivor? I can remember when one of the prostate people was diagnosed he was offered several treatment options, one of which was “watchful waiting.” With watchful waiting you do nothing, except closely monitor the cancer. If there is no change you do nothing, if the disease progresses you treat it. This option was immediately rejected. “I want it out” was what I remember him saying. So he had the surgery to remove his prostrate and all the cancer. It was difficult and there were some problems, but nothing that was immediately life threatening. Eventually he healed, his cancer was gone. He was done. For the breast cancer person, there was the diagnosis, lumpectomy followed by daily radiation for weeks. After the radiation she was carefully monitored to and placed on a daily maintenance regiment with medication. The medication had side effects including weight gain and fatigue. For the second prostate person, treatment was done using radioactive “seeds” that were placed in the prostate. This individual was older, had known that he’d had prostate cancer for a while and was following the watchful waiting protocol before initiating treatment. Because he is in his seventies, treatment may not cure his disease, but it is more likely to slow the progress and spread of the disease. Treatment also includes medication, including hormone treatment. These medications have side effects, again including weight gain and fatigue. My treatments have all involved chemotherapy. The first time I was treated, active treatment was about six month long with one session of chemo every twenty one days followed by five days of steroids. I lost my hair and although I got through most of the active phase successfully, I got sick towards the end of the six months and had to be hospitalized for several days. After that I was on a maintenance treatment for two years, with chemotherapy for several days every six months. I tolerated the maintenance chemo very well and it did not cause hair loss. Treatment was successful, the aggressive cancer was gone and the slow growing cancer was, for a short time not delectable. The second round of treatment was more difficult. I had a strong reaction to the chemotherapy and was hospitalized a few times during treatment. Again treatment was successful in knocking back the disease. The third time, the pathology of the disease had become obvious and I knew treatment was coming. The blood cancer had become more aggressive and a stem cell transplant was recommended. A third chemo regiment, hair loss and then the transplant. Unfortunately the transplant did not cure the cancer. The fourth chemotherapy regiment, nine months later was less aggressive than the third, and did not cause hair loss. The donor lymphocyte infusion did put the cancer in remission. My primary identity is as a husband, father, counselor and business man but cancer survivor is an undeniable part of who I am. So what makes someone identify as a cancer survivor? Is it the number of treatments? Is it hair loss, the fact that you are being treated is undeniable? What makes one person see them self as a survivor and the other not? This entry was posted in Inspiration and tagged cancer survivor. Bookmark the permalink.